InterContinental Resort Bali is a superb five-star resort hotel with 425 luxury rooms fronting 500 meters of a secluded, dazzling white-sand beach that shelves down to the azure blue water set in beautiful landscaped tropical gardens along the white sand beach at Jimbaran Bay. The west facing location takes full advantage of the world famous Bali sunsets that make for perfectly romantic moments in this tropical paradise. 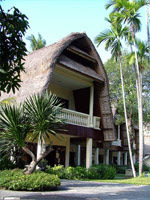 Within, the resort is rich in traditional Balinese materials and fine indigenous craftsmanship. The surrounding gardens are landscaped with lagoons, cascades and ornamental pools, sculpted in ancient palatial motifs. 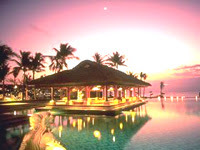 At dusk, the hotel is lit by spectacular sunsets over the endless ocean. All in this entire hotel has everything the tourist and business traveler could wish for and more. Centrally located minutes from Bali's premier tourist areas midway between the resort area of Nusa Dua and the Kuta shopping complex of. 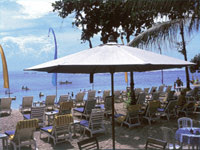 The hotel is just 10 minutes from the Ngurah Rai International Airport and close to the Bali Golf and Country Club. The hotel can arrange fantastic "Theme Nights" that promise great success include Sarong Party, Indonesian Rijsttaffel, Night Market, Mystical Night, Fishermen's Night and Gala Dinner. For lovebirds, the hotel provides wedding packages. Surrounded by beautiful lush flower gardens with ocean view, water lagoons with water lilies and a 500-meter-long private beach, weddings can be held at various venues outdoors as well as indoors. Experienced catering and sales service staff will ensure elegant, romantic and memorable weddings. For entertainment needs, the hotel has experienced conference and banqueting professionals. From Balinese traditional dancers to internationally acclaimed acts, almost anything is possible. On-site florists design floral arrangements to compliment all hotel functions using mostly a wide range of locally grown indigenous plants. Various photographers, offering anything from social coverage to the latest state of the art professional processing are available upon request. Information on product and service availability as well as visa requirements, import restrictions and customs clearance can obtained from the Purchasing and General Affairs Managers. Airport meeting and assistance services are available from the Resort. In addition, the hotel is fitted with a host of equipment for teambuilding activities and fun events. The recreation team can administer a professionally designed team building program. They have developed this activity in close cooperation with the resort's management while updating it with the most recent findings in the field. For those energetic people, the Marine Sports Center offers a wonderful choice of watersports. Club Inter-Continental is the welcome extra touch for those who chose to pay a small premium for a higher level of personalized service, exclusivity, superior accommodation and upgraded facilities and amenities. Personal service begins on your arrival, as you are met and escorted to Club Lounge, where a refreshing "welcome cocktail" awaits you. 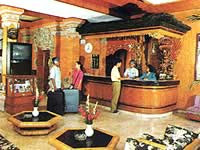 Check-in formalities may be completed there or in your room. Rooms are extra spacious and will be available to you until 4pm on your departure day without extra charge. Butlers will be happy to help you unpack and have your clothes pressed at no extra cost. Additional benefits during your stay at the club include complimentary breakfast in the privacy of your room or on your balcony, at the club or the Tama Gita Terrace Restaurant. If you prefer a full buffet breakfast, it will be available for you at the Taman Gita Terrace Restaurant at a small premium. The club lounge serves complimentary coffee, tea, soft drinks, free pre-dinner drinks and snacks. The lounge also features a large collection of books, magazines and games as well as international news from CNN, BBC, CFI, ABN and NHK. A complimentary newspaper of your choice will be delivered to your room daily. The Club Inter-Continental Pool is reserved for Club guests only. It features a jacuzzi and several comfortable balés. Enjoy one of the famous Balinese massages there. Drinks and snacks are available all day from the Club Bar. Free entrance to the Uluwatu Spa and Gym with its state of the art equipment during your stay at club is free of charge. The hotel has three swimming pools, three outdoor Jacuzzis in the gardens, squash and tennis courts, a children's playground, shopping arcades, beauty salon, clinic, a kid's Mini Resort, resort's Tour and Transportation Desk, concierge, car rental, shuttle bus and valet service and health club. All guestrooms and public areas are fitted with sprinklers and equipped with smoke detectors for the safety and well being of guests and hotel staff. The hotel also boasts a state-of-the-art alarm and notification system as well as a well-trained in-house emergency response team. Segara Village, located on the lush, tropical beach of Sanur, beckons visitors with the tradition and setting of kings of an ancient time. The rich culture and tranquility of Balinese life is echoed throughout Segara Village, which as the name suggest, is designed and built round the concept of Balinese village a theme that is repeated throughout the distinct compounds within the segara complex. The beauty of Segara Village is in its discovery. Here you can relax, enjoy your surroundings and let your imagination run wild. Explore the paths, nooks and crannies around the villages. The property is owned and runned by balinese family who practise their Hindu religion. Safety deposit boxes, Drugstore, Shopping arcade, Free form swimming pool and spa, Children's wadding pool & activities, Luggage store room, Tennis court, Library, Massage, Currency exchange, Baby sitting, Taxi service, Car rental, Tour & travel desk, Postal service, Laundry & dry cleaning, In-house doctor, Mini gymnasium, sauna, Watersports: windsurfing, parasailing, sailboat, canoe, diving, snorkeling etc. Game room: billiards, chess, video Corner culture activities: Balinese dancing, flower arranging, etc. 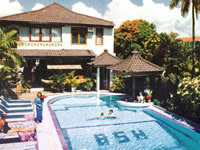 Bali Summer Hotel located on 5 minutes away from Ngurah Rai International Airport and only 10 minutes by cab to the city of Denpasar, in the heart of Bali's major tourist destination Kuta Beach, Bali Summer Hotel is your home base to reach all interesting spots this area has to offer within walking distance. 200 meters away from the world famous surfing challenge of Kuta Beach, Bali Summer Hotel is surrounded by bustling shopping areas, restaurants covering all wishes the hungry mind may imagine and entertainment not to experience within a vacation's time. Bali Summer Hotel offers all culinary deliciouses like seafood, Chinese cuisine and European specialties are available at our restaurant, the bar entertains with video program and all popular drinks and cocktails. On your exhausted moments Bali Summer Hotel is the ideal place for taking breaks at our swimming pool and having a relaxed time, being served by friendly attendants.